The new Plague Quarter offers three new bosses and two class challenges. If you're a Hearthstone player, you'd probably set up your Calendar or Reminder to alert you of the upcoming wings in Curse of Naxxramas. Every Tuesday 23:59 PM PDT, Blizzard will release the new wings. And today, it's time to play the Plague Quarter. This wing brings three new bosses with a couple of unique abilities. For example, Noth the Plaguebringer introduces us to passive hero power where the hero power will be activated automatically based on a particular trigger, instead of by paying its mana cost. For example, Noth's power is triggered whenever one of your minion dies. On the other hand, Heigan the Unclean forces you to pay attention where you put your minions in play. Noth the Plaguebringer: Passive - Whenever an enemy dies, raise a 1/1 Skeleton. Heigan the Unclean: (1) Deal 2 damage to the left-most enemy minion. Loatheb: (2) Deal 3 damage to the enemy hero. Similar to the Arachnid Quarter, you will get a total of six reward cards for completing the Normal mode and the Class Challenge in Plague Quarter. The reward cards for the Normal mode are Stoneskin Gargoyle, Unstable Ghoul, Studge Belcher, and the Legendary Loatheb. And, you will unlock Duplicate and Webspinner for beating the Mage and Hunter Class Challenges respectively. Noth the Plaguebringer: Passive - Whenever an enemy dies, raise a 5/5 Skeleton. Heigan the Unclean: Auto - Deal 3 damage to the left-most enemy minion. Loatheb: (0) Deal 3 damage to the enemy hero. The new class challenges in Plague Quarter are Hunter and Mage classes. To beat Noth the Plaguebringer in Normal mode, use a deck that can negate his power to spawn a 1/1 Skeleton each time one of your minion dies. Cards like Inner Rage and Cruel Taskmaster excel in this situation. Beware of his Plague spell which can destroy all non-Skeleton minions. To beat Heigan the Unclean in Normal mode, you need to be careful with Voidcaller's deathrattle ability. Because it allows the owner to play a Demon card from hand without paying its mana cost, you need to kill it only when the opponent has one or two cards in his hand, or when you have an extra removal spell in hand. To beat Loatheb in Normal mode, you need to maximize the leverage his Spore gives you. Because he has 75 HP, you're going to need to buff your minions significantly by using his Spore's deathrattle ability. Just keep in mind that you need to play as many minions as possible before killing his Spores. You may want to keep a 1-toughness removal spell in hand for that final turn. To beat Heigan the Unclean in Mage Class Challenge, you need to maximize on the Duplicate and Mad Scientist combo. While you won't be running out of Secrets in play, I'd suggest you focus on your health by playing any Ice Barrier, Vaporize, or Ice Block cards in your hand immediately. To beat Loatheb in Hunter Class Challenge, you will be playing with a deck of 30 Webspinners. Attack relentlessly to replace them with the real Beasts. Then, leverage on opponent's Spore for maximum damage. Beating Loatheb in Heroic mode can be really challenging. 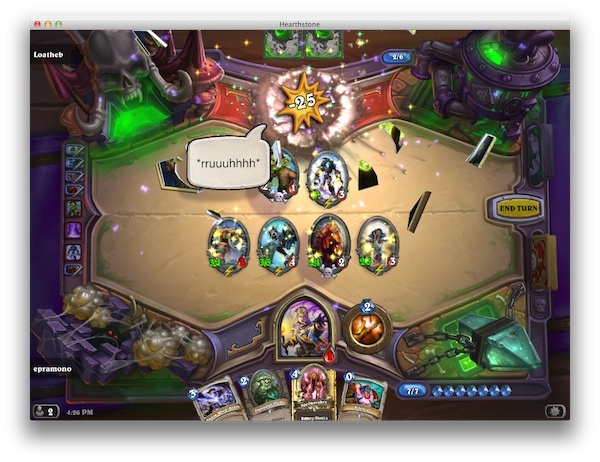 To beat the bosses in heroic mode, I created a custom Priest deck that utilizes a few combos, such as Lightwell/Inner Fire combo and Stoneskin Gargoyle/Northshire Cleric combo. To beat Noth the Plaguebringer in Heroic mode, you need to keep your minions from dying. That's one of the reasons why I used a Priest deck. But, don't go light on him. His deck has a lot of 4-power minions which always bring trouble to any Priest deck. Because his Skeleton is now a 5/5 instead of a 1/1, you need to bring in spells (such as Holy Fire) and minions (such as Frostwolf Warlord and Temple Enforcer) that can overcome the Skeletons without dying, because if you're trading your 5-toughness minion with his 5/5 Skeleton, you would only create a fresh 5/5 Skeleton on his side. To beat Heigan the Unclean in Heroic mode, you need to bring in some cheap cards to Silence or kill his Voidcaller who's already in play since the first turn. Remember that positioning your minions is key when playing against Heigan. If it's possible, try putting Stoneskin Gargoyle on the most-left position of your table. You might also want to bring in Gurubashi Berserker to capitalize on his auto heroic power. To beat Loatheb in Heroic mode, you need to play a very quick game. He has a Spore and a Fen Creeper in play since the first turn. His HP is 99, and you can't use Alexstrasza to bring it down to 15. To kill the Fen Creeper as soon as possible, you may need to mulligan until you can find Shadow Word: Pain and/or Elven Archer in your starting hand. Again, you need to rely on his Spores to bring down his enourmous HP. And, always count the damage properly because the game will end very quickly due to his Heroic power. The Plague Quarter introduces new cards that will shift the current metagame in an interesting direction. As always, the new cards in each wing always bring excitement to all players. I've already tried Stoneskin Gargoyle and Northshire Cleric combo, but I'd love to try Stoneskin Gargoyle in a Druid deck with a lot of buffers. I had a lot of fun playing that combo in the last Druid Class Challenge. The new cards also bring a nice shift in the metagame. We all know that Zoo decks are the prominent aggressive decks. The Plague Quarter introduces two anti-aggresive cards in Unstable Ghoul and Sludge Belcher. It would be interesting to see how the metagame shifts after Plague Quarter. Loatheb is definitely an anti combo/spell-heavy deck. But, he's also a good minion to play to prevent an AoE spell from ruining your board position. I could imagine many aggressive/tempo decks carrying him. The other two Class-specific cards are a bit difficult to predict. Webspinner looks like a cheaper version of Animal Companion that may bring in a mixed result. On the other hand, Duplicate is much more complicated due to its potentials. If you want to know what kinds of Duplicate decks people are experimenting, try looking at this list. After playing the Arachnid Quarter, I'd have to say that Plague Quarter is a bit easier to beat. But, I'd argue that it brings two anti-aggressive cards in Unstable Ghoul and Sludge Belcher to shift the metagame away from Zoo. It'd be nice to see how people would craft their new decks with anti cards, including Loatheb, that are introduced in this wing.